CLOSE ON THE HEELS: Romeo Dodds of the Melbourne team maintained possession of the ball despite being chased by Catherine Hall’s Taj Robinson during their St. James FA Sandals Resorts International Major League match played at Albion on Thursday. Melbourne Mind Games won the game 1-0. 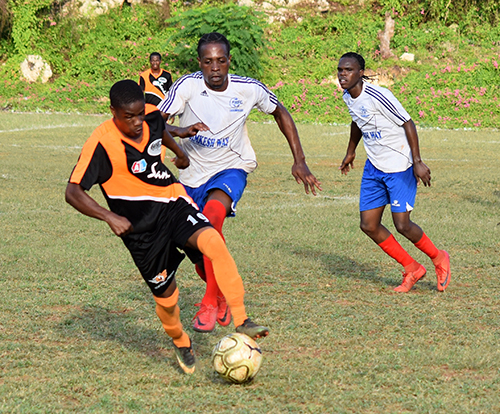 Smooth-sailing Lilliput Rovers will look to extend their excellent early season form in the St. James Football Association Sandals Resorts International Major League when they tackle struggling Irwin in a lone Monday game (February 4) set to be played out at the Irwin High School. Rovers, former many-times semi-finalists, take aim at a third straight as they bid for a return to sole leadership of Zone 1, ‘The Group of death’. They will be up against an Irwin side that has yet to mark off a win, their only point coming from a drawn result. Irwin have also managed to score just once in two outings, with their strike force seemingly lacking in confidence. Rovers, who flattered to deceive last year, flopping out at the last four hurdle, are yet to conceded a goal while they have hit the back of their opponents’ net five times already. Promoted Bogue and Cambridge, still yet to secure a victory, look to break that jinks when the two come face to face on Tuesday in an affair that promises to be exciting. Matches are slated to kick-off at 3 p.m. Meanwhile, as action continued at the start of the weekend, Melbourne Mind Games nabbed a second straight victory, clipping Catherine Hall 1-0 in a competitive and entertaining showdown at the Albion playfield, while Marl Road and MoBay City, shared eight goals down the middle in a 4-4 thriller at the UDC field. Watched by a good-sized crowd on hand at Albion, Melbourne, who began the season with a heavy defeat, roared back in fine form and moved their points tally to six with victory over their longtime rivals. The vital goal of the contest came in the 67th minute through substitute Trevon Allen. Allen slotted in mere ten seconds after getting onto the pitch, and with his very first touch of the ball, getting on the end of an ill-timed back pass to roll the ball into an unguarded net between the defender and the advancing goalkeeper. Catherine Hall, suffering their first defeat of the campaign, were wasteful in-front of goal, failing to take any of their many chances created, especially in the second half. Jamario Wallace had one of the clearest chances for the losers, crashing his unchallenged shot from inside the 18-yard-box onto the crossbar as timed expired. Malik Cummings and Kemar Reid also missed glorious chances as the Garfield Anderson-coached Catherine Hall, who moved the ball around with ease playing slick one-two passes almost always, lacked composure to finish. Meantime, it was goals galore at the UDC field as for the second time in three outings, Marl Road squandered an advantage and were forced to share points with their opponents, playing out a 4-4 draw with youthful MoBay City, who with the result, remained undefeated. In the latest clash, free-scoring Marl Road raced to a 3-1 lead 25 minutes in, through a stunning hat-trick by Shevon Smith, only to be pegged back by a charging City side who placed themselves in a winning position before conceding late in time added on. Marl Road, through the energetic Smith, started like a runaway train and raced into a cushioned advantage, scoring in the 7th, 20th and 25th minutes. Smith opened the scoring when he stabbed in uncontested at the near post, before adding a second from the penalty spot. He later completed the three-timer, getting on the end of a defense-splitting to pass to slot in on the run past the goalkeeper. MoBay City, who had cut the deficit to one early on with a goal from the penalty spot from Brandon Curate after 18 minutes, produced a sensational comeback, striking three times in the second half, including what should have been the winner, but failed to hold. Ryan Baker, Chris Christian in the 30th and 65th minutes and Kenrick Smith, with what looked like the winner on the stroke of full time, were the scorers for the MoBay City team, who remained undefeated. The Leacroft Lettman-coached team should have won the contest but missed a flurry of chances, mostly one-on-ones with the goalkeeper. On each occasion, however, the attackers fluffed their shots.